As we continue to explore data visualizations with our students, we are particularly aware of the importance of graphicacy to the modern learner. Tommy McCall hit the nail on the head when he called “graphicacy the neglected step child in the classroom” in his TEDx East talk on Literacy, Numeracy, And Graphicacy. In the new e-cology to design and create digital content that is transmitted, interactive, and shared, it is even more vital to incorporate graphicacy skills in our lessons. 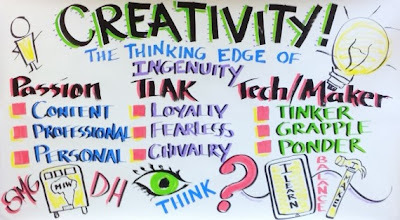 Today, learners need to analyze information that is interconnected with society and the environment, and that is continually transmitted, remixed and shared. This comingling of content using text, images, and data in multiple formats shapes the way we interact with visual communications. By training kids to thoroughly study what they see, we reinforce their visual acuity, attention to detail, and ability to notice conspicuous absences of information. We want them to develop a keen eye for seeing, to detect problems, and to understand the message inherent in the design. 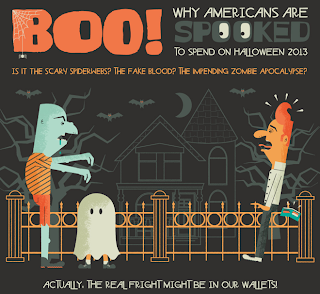 With the enormous influx of data visualizations, infographics, motion graphics, and more, educators need to build in opportunities to incorporate graphicacy skills beyond maps, charts, and diagrams in textbooks. Now more than ever, students need to practice visual decoding and encoding in an active way to articulate what is seen and not seen. The PBSoffbook video, The Art of Data Visualization, reinforces the multifaceted aspects of content delivery and the role of design in the process. 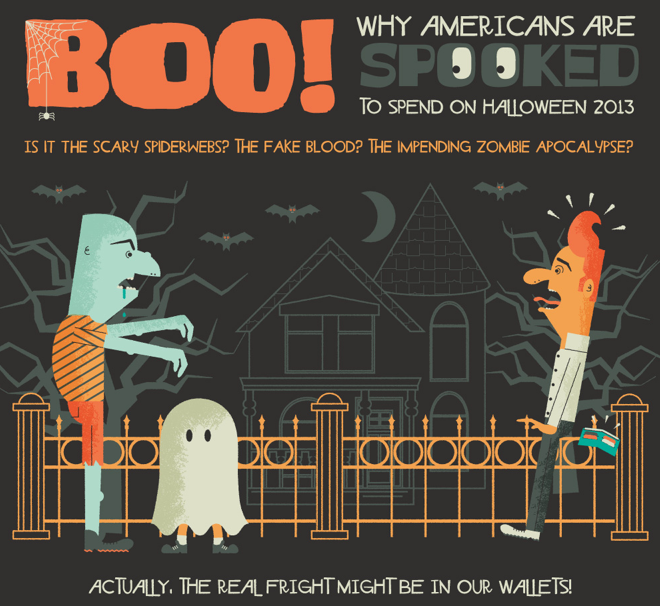 It features commentary by data visualization pioneer Edward Tufte, Julie Steele from O’Reilly Radar, Josh Smith from Hyperakt, and software artist Jer Thorp. Each discussion describes the role of design, content, and audience. Tufte talks about the need to respect your audience and know your content. For him, no amount of style will make up for poor content. His closing comments on wanting to see to learn something and not just to confirm it, particularly hit at the heart of why we need to teach students the art of seeing. 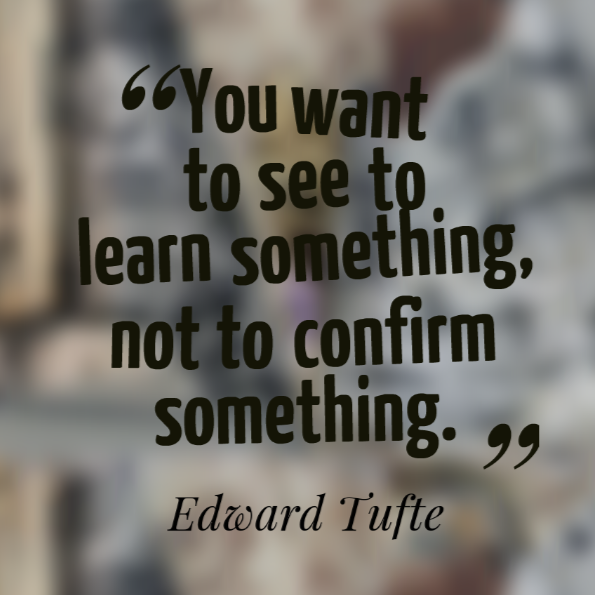 As educators, we want our students not to look at content to confirm what they see, but to see to learn. 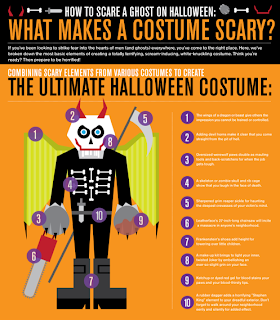 Some of the takeaways from the others are equally as validating in supporting this idea. 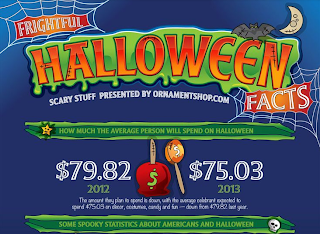 Julie Steele talks about the relationship between the designer, the viewer, and the data that make up visualizations. For Steele, designers use visual patterns to make decisions in order to trigger emotional reactions from the reader. 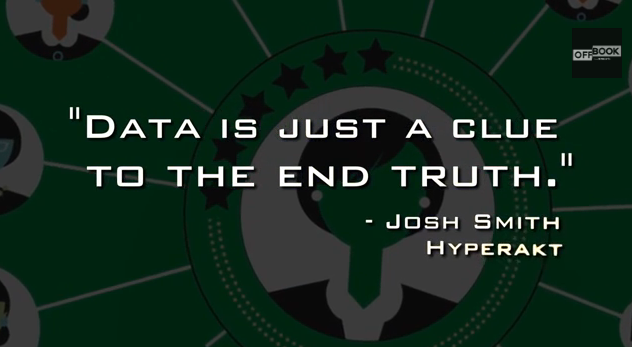 Josh Smith describes how data tells a story and how the visualization is a narrative around it, and Jer Thorp sees a strong connection between data and culture. As with any other literacies, we need to make sure that the core underpinnings of graphicacy seamlessly enter our classrooms. Visual forms of communication challenge the very nature of how we look at content, because they are social, organic, interactive, and constructed. This is why it’s important for our learners to have a solid foundation in the art of seeing, and we need to teach them how. Most English and social studies teachers no longer view graphic novels as simply "long comic books." 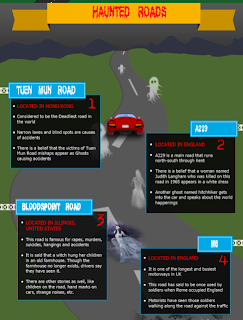 The educational benefits of blending illustrations with narratives have been well established. But rarely do books come along that masterfully capture the dynamic, eye-popping power of art and history. 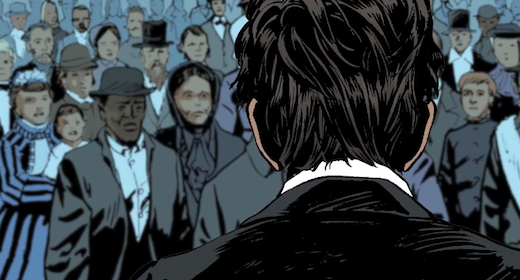 We are currently mesmerized by one such book, The Gettysburg Address: A Graphic Adaptation, with text by Jonathan Hennessey and visuals by Aaron McConnell. We're not normally in the habit of plugging specific books, but this expert volume could become an American history textbook for the visual generation. The stunning paperback uses "Lincoln's words to tell the whole story of America's Civil War, 1776 to the present." The book is thrilling in its account of regional rifts and in its pictorial precision on each page. Even more so, the book reinforces the key skills of graphicacy, where words and images unite to offer an enhanced presentation of facts and themes. Here, the sequential art translates action and communicates cause-and-effect for certain learners in ways that traditional paragraphs cannot. 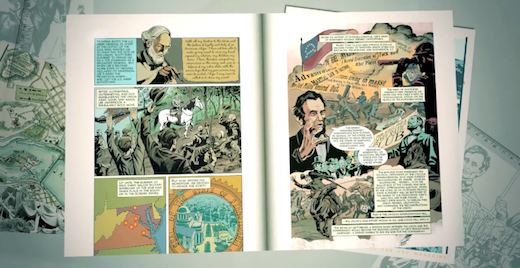 We've been long-time admirers of the authors' prior creation, The United States Constitution: A Graphic Adaptation, which made our nation's foundational legal document accessible (and even exciting) for our middle-schoolers. 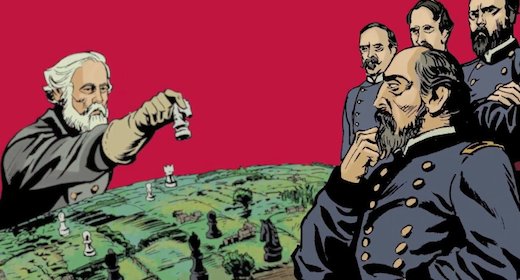 Similar to Larry Gonick's superb The Cartoon History Of The United States, young doodlers or comic fans are instantly drawn to the compelling shades and textures of the Gettysburg panels. They then internalize the critical messages of national division and leadership decision-making. For older students, a discussion of visual rhetoric could offer avenues for acknowledging time, motion, and the "manipulation of viewer experience." One of our guiding questions in our history curriculum this year is, “How do economies affect the rise and fall of empires?” So in a room full of middle schoolers learning about the fall of the Roman Empire and its trouble funding its expenses, questions about the United States government defaulting on its debt were bound to come up in the class discussion. We have to admit that our push to include current events on a regular basis has made our learners aware of the government shutdown, as well as the impending crisis looming over the country regarding the debt ceiling. While the United States is not Ancient Rome, the students were quick to see some comparisons in not being able to make payments on the government’s expenses. Since financial literacy is also an integral part of our curriculum, we continually remind our students that you need to have the money to buy the things you want. Indeed, when they play The Stock Market Game, many do not touch their margins so as not to go into debt. 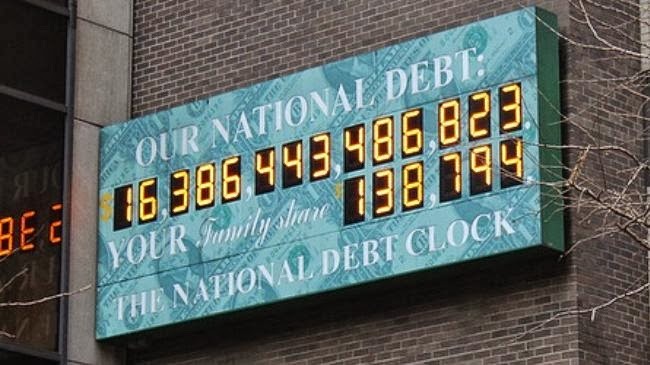 To help them better understand just how much money the government owes, we showed them this clear and concise infographic from NPR. This visual graph, called a tree map, made it easy for the students to see the breakdown of the $16.8 trillion debt for foreign and domestic expenses. We recently finished our back-to-school night with our parents, and thanks to ideas from our PLN, it was quite different from what we’ve done in the past. Instead of the usual distribution of paper outlining our course description, class expectations, and grading policy, we opted for a graphical display of ideas. We’ve participated in workshops, followed discussions on Twitter, and kept up with blogs about graphic facilitation, sketchnotes, and visualizing information to know of their utility. More importantly, though, it has been the connections with other educators in our PLN that have made a difference. This visualization was done ahead of time and was larger then your typical interactive whiteboard projection. All the talking points, from bullets to images, were large, colorful, and definitely held our parent’s attention. By using graphic facilitation, we needed no notes. The visual notes were right in front of us. 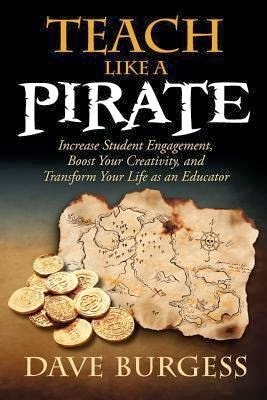 Our bullets on passion come directly from the book, Teach Like A Pirate, by Dave Burgess. We have also in the past had the opportunity to see him live. If there is anyone who exudes passion, it’s Dave. For teachers, passion for their content, profession, and personal goals all matter. Like an orchestra, they work together in concert. This is also what we want from our learners, and as educators our job is to cultivate it by letting our kids know that inside and outside, passions matter to learning and to us. While we don’t have a pirate in the room, we do have an eight-foot knight. 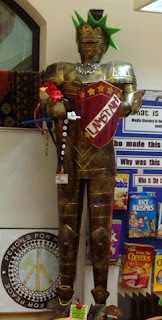 So to teach and learn like one, we decided on three words – loyalty, fearless, and chivalry. Loyalty to each other as a collective whole, fearless about learning, and showing respect are all important to working together in collaboration. Whatever it takes to build that bond is worth it. Balancing technology and making is also an important part of learning, and kids need to tinker with their hands, grapple with problems, and ponder ideas. 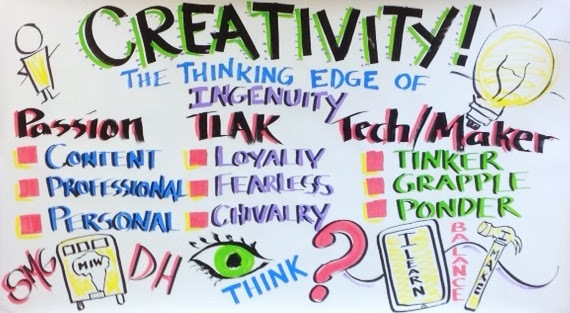 As connected educators we want to ensure that our learners are connected in a digital environment, yet we equally value an “I Make” approach that lets them touch materials and not just a screen. We’ve built on this idea from our connections with others in the maker movement, and we stand by our motto "Make It, Own It, Learn It." Striking this balance both in and out of school was a message we wanted our parents to hear, too. Suffice it to say, using this type of presentation not only enabled us to be more engaged with a room full of parents, but it also gave them a clear understanding that we draw our inspiration from a wealth of educators in our PLNs. So thank you all. The shutdown of the United States government began today. With no plan of action from either political party, there is consequently no easy lesson for teachers to share with their students. Any discussion of the current Congressional stalemate naturally begins with a civics lesson about political parties and the separation of powers. The questions today from our students, however, quickly centered on issues of blame and health care. 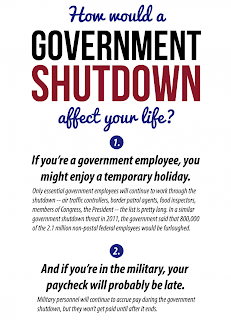 Fortunately, a collection of visual resources from various media outlets do exist to help children learn about the overarching meaning of a shutdown, as well as more granular details about federal budgets and opinion polls. A good place to start is the short video from the BBC, entitled "US Government Shutdown In 60 Seconds." The clip addresses questions that might be worrying children, such as whether the pandas in the National Zoo will be fed (yes). 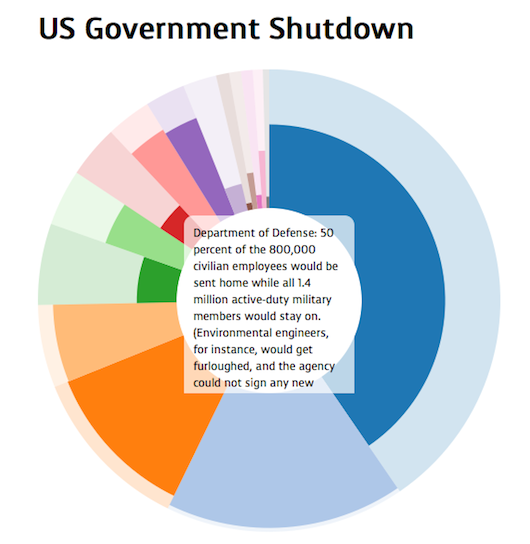 Another key interactive tool is the "US Government Shutdown" visualization from Michael Bauer at School Of Data. By rolling over variously sized color bars, the pop-up box provides figures about how each federal agency will be affected. 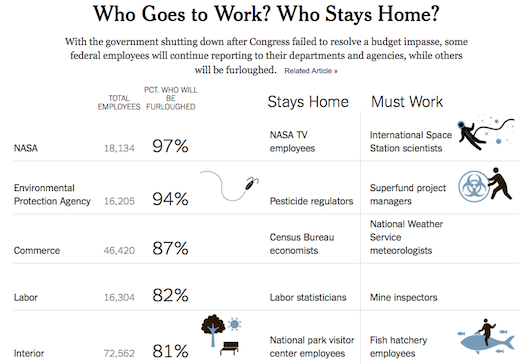 Bauer's interface is similar to the helpful infographic from The New York Times, entitled "Who Goes To Work? 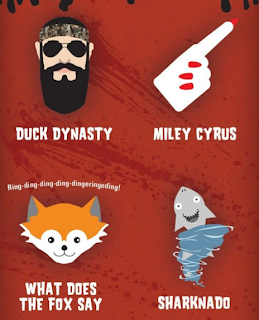 Who Stays Home?" 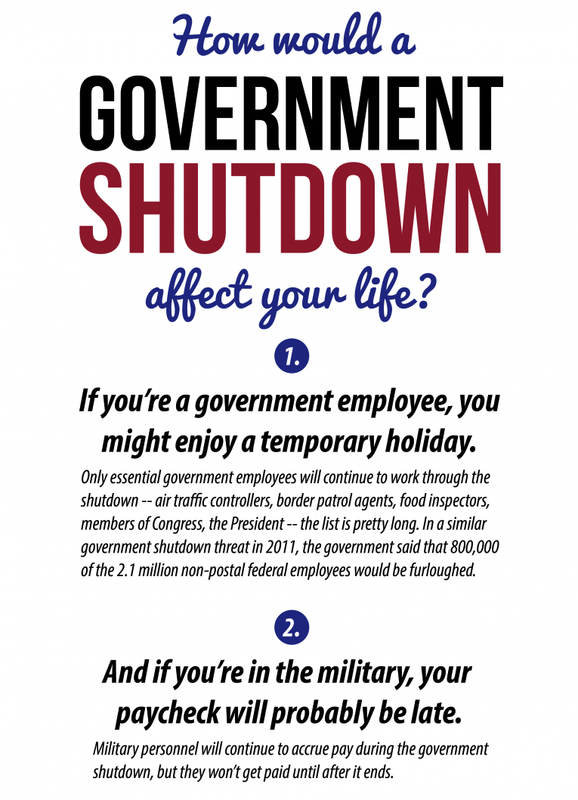 To explore how individual citizens will be impacted by the shuttering of departments, have the students explore the infographic from the International Business Times, entitled "How Would A Government Shutdown Affect Your Life?" 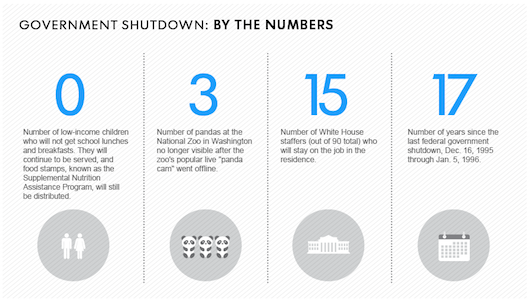 Or take a look at the slide show from USA Today that catalogs the "Government Shutdown By The Numbers." 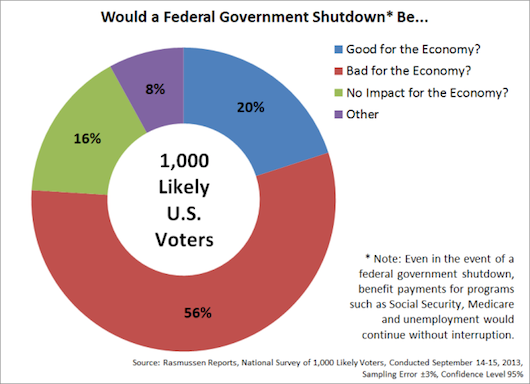 If students ask questions about which party is to blame, or about how the American people will react, take a look at the graph of a Rasmussen poll that asks, "Would A Government Shutdown Be..."
You could also share the results that found a "Majority Want No Shutdown." 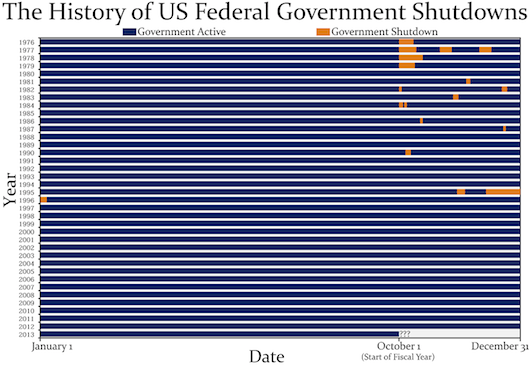 If you are searching for historical information about past government closures, the bar graph from Seth Kadish at Vizual Statistix documents the anomalous nature of our current predicament. For a road map to the current termination, the graphic designers at The New York Times have once again put together a clear and illuminating flowchart of Congressional actions. 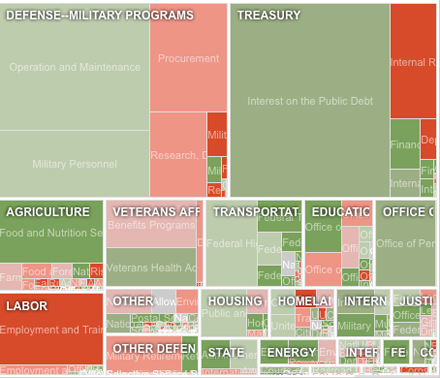 Finally, if your students are having a hard time understanding the basic nature of the federal budget, try incorporating the interactive chart from the New York Times that details every 2012 proposed expenditure. 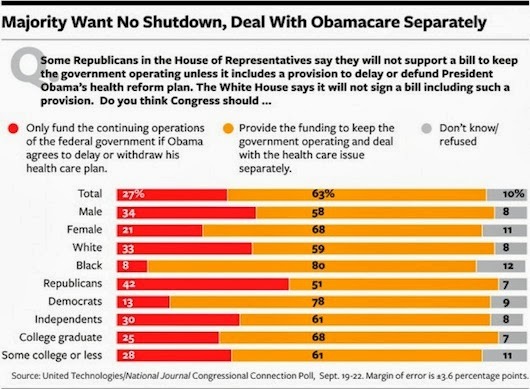 It is posted on a terrific list of graphs via Poynter, entitled "As Government Shutdown Looms, 5 Interactives Explain The Budget Battle."